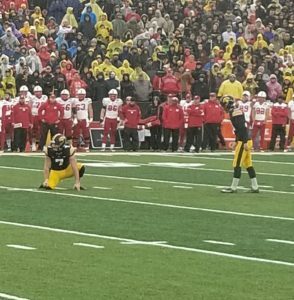 Iowa kicker Miguel Recinos lines up for what would prove to be the game-winning field goal during Iowa’s 31-28 win over Nebraska on Nov. 23, 2018. IOWA CITY – It all started with a miss. Iowa’s 31-28 win over Nebraska Friday afternoon was decided on a 41-yard field goal off the right foot of kicker Miguel Recinos. With the Hawkeyes (8-4/5-4) clinging to a 28-20 lead in the fourth quarter the senior kicker had missed a 37-yard field goal attempt wide right. That miss came with just under eight minutes remaining in the game. It also started the ball rolling on some late season dramatics. Recinos watched from the sideline as Nebraska quarterback Adrian Martinez led the Huskers on a 13-play, 80-yard scoring drive to knot the game at 28-28. The Hawkeyes would get the ball back with 3 minutes and 22 seconds left in the game and Recinos would get his shot at redemption. It was a moment that almost didn’t come. Iowa sent its offense on the field when it faced a 4th-and-eight from the Huskers’ 37 on the seventh play of the drive. With Iowa’s offense on the field, perhaps in the hopes of darwing an offsides penalty, Nebraska called time out to stop the clock. But Scott Frost had unwittingly showed his hand. “We had a play we felt good about (with the right look),” Iowa coach Kirk Ferentz said. The Hawkeyes emerged from the time out with the offensive unit still on the field and quarterback Nate Stanley completed his 16th and final pass of the afternoon to tight end T. J. Hockenson for a gain of 10 yards and a fresh set of downs. “That’s a gutsy decision by them,” Frost said. Iowa was nearing field goal range for Recinos and a run of four yards by Mekhi Sargent set the table for some game-winning heroics. Nebraska, though, had a time out to call. Again, Frost had no idea he was giving the Hawks exactly what they wanted in that moment. One Hawk, in particular, was especially pleased. “I think old Frost made a big mistake calling time out on that one because it kind of gave me an opportunity to get the guys together,” Recinos recalled. The ball sailed 41 yards through a light drizzle as time expired. Recinos’ teammates chased him down, ending their on-field celebration only when it occurred to them they needed to reclaim the Heroes Game Trophy. What’s next for Recinos? He said the seniors are having a “get together” tonight. He’ll also have one more game to suit up for. Wherever they land Ferentz knows it’ll be warmer than last year’s bowl destination of New York City. Nebraska, meanwhile, finishes Frost’s first year in Lincoln at 4-8. Friday’s win was Iowa’s fourth straight over the Huskers. Running that number to five in 2019 will be easier said than done but next season is a long way off. In the here and now Iowa was a field goal better than the Huskers on Friday. And all it took to learn that was a miss.